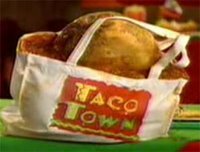 I got to see one of my favorite commercial spoofs on SNL last night: "Taco Town"!! It's not just a spoof of Taco Bell, but of the entire fast food industry that has been creating bigger and bigger menu items. You can watch the SNL parody video of this 'taco' from Taco Town: A crunchy all beef taco smothered in nacho cheese, lettuce, tomato, and special Southwestern sauce; wrapped in a soft flour tortilla with a layer of re-fried beans in between; wrapped in a savory corn tortilla with a middle layer of Monterrey jack cheese; wrapped in a deep fried gordita shell smeared with a layer of special 'guacomolito' sauce; wrapped in a corn husk filled with pico de gallo; wrapped in an authentic Parisian crepe filled with egg, gruyere, sausage and portobello mushrooms; wrapped in a Chicago-style, deep-dish, meat lover's pizza; rolled up in a blueberry pancake; dipped in batter and deep fried until it's golden brown; and served in a commemorative tote bag filled with spicy vegetarian chili. With real items like BK's Enormous Omelet Sandwich that almost seems plausible! Oh god, that was hilarious. Just when I thought it couldn't get worse, they broke out the pancake. Thanks for posting this video! Since many pizza huts share restraunt buildings with taco bells now, I am sure some employee making their special taco for their own lunch is going to try the pizza wrapped taco!! you need to have better information people can use in reports and such. I fixed it, it says Andy now. Sorry Erin (and Andy). One of the top five funniest commercials that Saturday Night has ever produced. It blew me away. Actually, you are wrong. There is a place that makes a burrito that has a taco, grilled chicken, pepperoni pizza, and other stuff in it. I have seen it before and it does exist. This is what they are making fun of. That was just an ordinary Chicago's Inn flat pizza. That was not a Chicago-style deepdish meatlover's pizza, which would be about two inches thick and unfoldable.